Here at Alpine Food Storage, we offer a wide variety of grains in bulk for long-term storage. Most grains come in 4 different packages: #10 cans, 6-gallon buckets, and 25- or 50-lb bags. 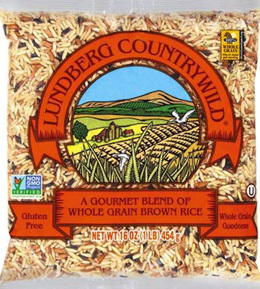 Many of our grains, such as amaranth, quinoa, spelt, kamut, buckwheat, etc. are organic. With other grains we can special-order organic options. We have started using a wider variety of grains and have found that they are really very easy to incorporate into daily meals. So many of these "alternate" grains are much higher in protein than is wheat. All are good sources of fiber and numerous vitamins and minerals. Adding more whole grains to one's daily diet will greatly improve health and stamina! Remember that sprouting is a GREAT way to eat grains. We offer a fantastic gluten-free bread mix. This bread isn't the typical "white cardboard" those of you who are gluten-free are used to. 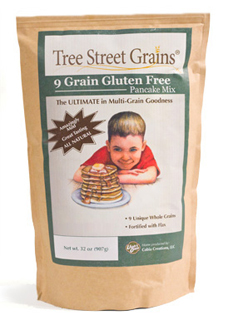 It has 9 different gluten-free grains, which gives it tons of flavor, and it cooks up much like a whole wheat bread. Haven't had a sandwich in a while? Now you can! 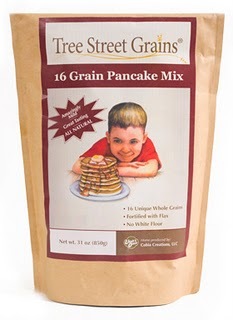 A wonderful Gluten-Free version of the above pancake mix. Reports, from those who have tried it, have been extremely favorable! Also check out the amazing Gluten-Free Bread Mix from the same company. Reports from those who have tried it have been extremely favorable! Recipe: 1 egg, 2 Tbs vegetable oil, 3/4 cup milk to 1 cup of mix; makes 6 pancakes. This pasta comes from a company in California that makes it fresh after we order it—unlike the pasta we buy at the store that has been sitting in a warehouse for up to a year or longer. It is dried pasta in many varieties including organic, organic whole wheat, organic multi-grain (Ingredients: spelt, kamut, whole wheat and semolina), spinach, rainbow, and "plain ole" pasta. For those of you who may be wondering, the whole-grain pasta, spinach pasta and rainbow pasta are fantastic! We have had nothing but positive comments from those who have bought it previously. The appeal of this brown rice is in the way it is processed. Rather than hulling the whole harvest of rice, this company puts it up in huge, temperature-controlled rooms, where it stays until they have an order for it. Then it is hulled and shipped out. Thus it is very fresh. But the company goes further! They use a very gentle hulling process that keeps the rice whole. Because of this process, surface-scratching and breaking of the grain is avoided, which does not allow the oils in the rice to go rancid. Therefore: THIS BROWN RICE WILL LAST MUCH LONGER THAN WILL THE VARIETIES SOLD IN THE GROCERY STORE! 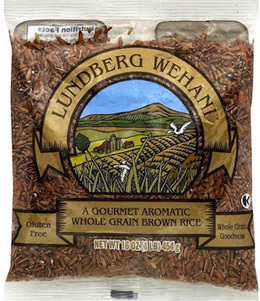 We offer all the varieties that Lundberg grows: Long Grain Brown, Short Grain Brown, Sweet Brown, Brown Basmati, Brown Jasmine, Wehani, Black Japonica—as well as their entire line of white rices. For more information on what is available, see the bottom of this page. Pretty and understated, Jubilee® balances a subtle aroma, restrained sweetness and mellow flavors. Add a touch of sophistication to your meal with this festive and colorful blend of Wehani®, Black Japonica™, short- and medium-grain red rice, short- and long-grain brown rice and sweet brown rice. Spectacular! Honey-red grains separate for a truly handsome presentation. The distinctive aroma will fill your kitchen with the promise of an irresistible nutty flavor. 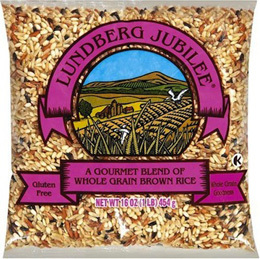 Beginning with an Indian Basmati-type seed, Lundberg® worked 10 years to perfect this incredible rice. 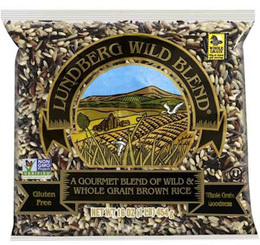 Juicy with a nutty, mushroom-like flavor energized with an exotic, sweet spiciness, brought to you exclusively from Lundberg Family Farms®. 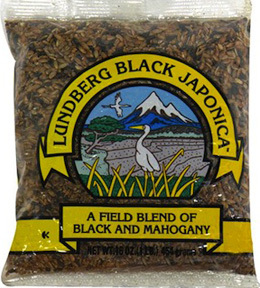 A good-looking, whole-grain brown rice blend of short-grain black rice and medium-grain mahogany rice, it originates from Japanese seeds. Colorful to the eye, delightful texture and full-bodied flavor and aroma all come together in this blend of long-grain brown rice, sweet brown rice, Wehani®, Black Japonica™ and select wild rice pieces. Wild Blend® is versatile, so serve it up with hearty meals or subtle seafood dishes. Want rice that's rich and tasty for your next meal? Put Countrywild® on the table. This outstanding blend of Wehani®, long-grain brown rice and Black Japonica™ has plenty of fragrance, color and flavor with an attractive separateness of grain. 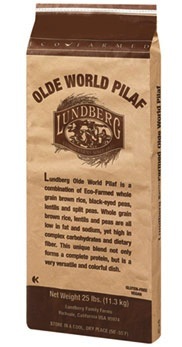 Lundberg® Olde World Pilaf is a combination of Eco-Farmed Gourmet Brown rice, black-eyed peas, lentils and split peas. Brown rice, lentils and peas are all low in fat and sodium yet high in complex carbohydrates and dietary fiber. This unique combination not only forms a complete protein but is a very versatile and colorful dish.